Well…you guys almost broke my blog! The day I posted about My Mom, hundreds of you left a comment. Every single one (and I have read them all) was a blessing. Each one of you is a blessing. I am honestly having a hard time coming up with the words to convey my thanks. I don’t know how to adequately express how grateful I am for your friendship…so I hope you just know. You generously shared your own stories and each one had its own message. You held me up when all I wanted to do was crumble. My mom’s death has changed me forever. The phrase “life is short” has a brand new meaning. I want to live each moment like it was my last and not waste even one day. I know that might sound sort of dramatic, but I honestly feel differently about the years ahead. I can’t explain it fully but I want to try harder, love without reservation and live in the moment. I need to get back to work. So many of you said to give myself time…and I promise I will…but I need to fill my days with something positive and wonderful. I can’t think of a better way to do that than hanging out with all of you. This blog has saved me countless times. Once again, it is coming to the rescue. So many of you have asked about my dad. He is actually doing pretty good. We both have our moments of course…but we are starting to remember how my mom was before she got sick. I won’t let her final years define her and my dad feels the same way. We have no regrets. We both know we did the very best we could in regards to her care. We certainly weren’t perfect but we should get an “A” for effort. We are incredibly grateful that she was able to come home and be with us at the end of her life. My dad always put her happiness and well-being before his. He has been an incredible role model…not just for me but for my kids. That in itself is a precious gift. Click to download the Live in the Moment Free Printable. I’ve been away from blog-reading for a few weeks and just saw your sad news about your mom. I am so sorry, Anne! I can truly relate to what you are going through, as I have lost both of my parents in the past five years. I feel like a different person now in many ways. I’m finding myself questioning everything about my life, yet appreciating the good days even more. It is a restless time, waiting for my “new normal” to fall into place. I’m glad for you that you find contentment and purpose in your blog, because I know your readers feel a connection to you in return. I wish happiness and peace for you in the days ahead. Who can blame you? I’m glad you are feeling like blogging, and I agree it certainly makes you look at life differently. I just read about your mom, and this must be so difficult for you. I’m thinking about you. My heart feels your pain , your mother would love your idea of living with intention . I’m sure your family brought her so much joy. So blessed you and your Dad are close and offer each other support , friendship and love. God bless you in your healing. I know how you feel, as I said, my mom past away a year ago. I still keep thinking of her and things to share with her. Somehow I feel like an orphan now that both parents are gone. Please focus on all your happy memories to get you through the tough days. (At Christmas I did up photo albums for us adult siblings, things to remember of our growing up years. Now that Christmas has past, I have spent time doing one for myself.). I know exactly what you mean when you said, “it has changed your life forever”. Going through a similar situation with my grandmother has completely made me re-evaluate life itself! All that we hold precious and dear in life can be taken away in a split second…and yet we all focus so much on the stupid stuff? Go figure. Before my grandmother stopped talking, she wanted me to know that she really appreciated everything that I’ve done for her…but the funny thing is, it’s what she has given me that I’ll never forget! I broke down into tears when she said that, and I told her that the gift that she’s given me from taking care of her will be something that I’ll cherish until the end of time. Bless you Cindy…hope all is well. My condolences. Losing a parent is heart wrenching if you were close and know you were loved. It was life changing when I lost my mother. I started a new career and decided to live a more meaningful and less stressed life. Best wishes as you move forward and heal your heart. I’m glad to hear from you and it’s good to know you and your dad are coping the best you can. Sending you love and rays of sunshine today. I am just getting caught up on my email. I am so sorry to read about your Mother! I lost my Mother just after the holidays, too. It was quite sudden and unexpected. I know about the void this loss leaves. Life is never the same afterwards. It can be so overwhelming. Stay close to God and family as you can find great comfort there. You are right about feeling like life is so short and taking advantage of every moment in every day. Peace be with you! Hi Ann…you made my heart happy to see that you are back and “living in the moment.” I had tears reading your post…You share your creativity and your heart! Continued blessings and comfort to your family. You know, when My grandmother died 30 some years ago (wow, just realized how long ago it was) it truly hit me hard. I was closer to her and my grandfather than my own parents and I miss both of them everyday. My husband even says I’m more like her than anyone else in my family. One thing my aunt, her daughter, and I did was clean house for my grandfather. She had been a bit of a hoarder during her later years (now I know where I get it from) and he hadn’t had the energy to deal with it because he was caring for her during her last years.We had a lot of laughs over the things we found, a lot of surprises, and I have some love letters and fabric to remember her by. I hope he didn’t mind, he never said, but I think it helped him too. It was still their house and he outlived her by 10 years, and he had many good memories of their times in the home they made. My heart hurts for you as I lost my Mother in Love October 3rd, 2015. She was my dearest friend and I miss her so. I have so many wonderful memories that I think of each and every day and it is a comfort to me. I pray for comfort and renewed energy for you. When my BFF of mostly all my life passed away from a long battle of a rare kidney disease, I told her hubby that I do not know what to do, now that she is gone. He told me that he will tell me what to do in one word, “live” .. so I focus on his advice and try to embrace each moment, each blessing in my life..Glad you are back Ann. I’m glad to hear that you have such a positive attitude about the days ahead. Nothing really prepares us but faith, family and friends certainly help us as we move on. I know what you mean about our faith. I heard someone this week say that our loved ones would never want to leave Heaven. They are just waiting for us to join them. I like the thought that our mothers are patiently waiting for us. It’s a very comforting thought. I think the Easter message will strike deeply with you this year, too. We will see our mothers again. Glad to read that you and your dad are doing well. When my friend lost her son, going back to work full time was exactly what she needed too. Thank you for the pretty printable. Continued prayers for you and your family. I came upon this a few days ago and it really helped me with a recent loss. May God uphold you with His love. Know that I’m in a happy place. So glad that you and your Dad are doing well. I think it helps to stay busy and not dwell to much on sad times. I’m sure you will have lovely memories of your Mom in better days ! So glad everything is going smoothly. When I lost my mom,i decided to do Christmas and flower gardens like her.My parents were very close but, he lived 13 more years without her. I miss them both but know they are so much better.Have a wonderful day and keeps those wonderful memories alive. great to hear from you especially that your dad is managing. I totally get the life change. After we lost my mother in law a bit over 2 yrs ago I changed too. She loved her life and let nothing stop her from sitting down in a mess to sew or talk or simply be with you. I am such a worker bee always on task BUT now I remember the value in being in the moment. Today I have so much to catch up but I’m intentionally making some Easter gifts for my grandluvs and a friend’s grandluvs out of quilt blocks she hand pieced/sewed because I can…and should! Will be printing that download! Thanks. And THANK YOU for your determination to continue to generously share yourself & your inspiration with us. My thoughts and prayers have been with you throughout the difficult time you’ve just gone through. I lost both of my parents: my Mother in 1995 to Alzheimer’s Disease and my Dad in 2004 at age 92. Dad lived with my husband and I the last 2 years of his life and it was such a blessing to have him close. We’d lived across the country for many years so that time was especially dear. My God grant you peace. Ann, so sorry for the loss of your mother. My mom died on Thanksgiving Day, twelve years ago. Not a day goes by that I don’t think of my mom. Prayers for you and your family. Your blog is a gift to us, your readers. So pleased that you will continue to inspire us. It has always comforted me in my times of grief and heartache. Hoping for brighter days ahead for you and your family. just remember Ann as my Mother always told me “Busy hands Happy Heart” and I know this to be so true…..
Ann, Nice to see another post. I am sure it feels good to distract yourself by engaging in work stuff. Grief is a process and I am sure you will find your way. Plenty of rest, nutritious food and exercise will all help. Friends to talk with, ones that share your grief, are invaluable as well. God bless. Ann, So sorry to hear of your loss! Hugs, thoughts and prayers sent your way. Sending my sympathy. I agree with you needing time and don’t be too hard on yourself. Grieving is such a personal thing with no right or wrong way. Today is the anniversary of my father’s passing. It has been 15 years; hard for me to believe it’s been that long. He is in my heart always. Take good care of yourself and grieve in your own way. I continue to pray for you Ann and your family. My heart knows how are feeling. Tomorrow my mom will be gone six years. I still miss her but I’m filled with beautiful memories she made with me and my family. My heart truly aches for you Ann as I read the news of your mom’s recent passing. The reason this hurts me in such a deep way is that I too just loss my mom. The wound is so fresh and it appears we are aching at the same time. I love the printable you provided as a reminder of the perspective in life we should keep close at heart as our lives go on. I am sending you a hug of “sisterly mourning” as it appears we are grieving the same loss, at the same time. Words cannot take the pain away, but hopefully they can provide a comfort and a reminder to remember all of the smiles that our moms brought to our lives; while they were living and as we remember them, always. Hugs to you and your family Ann. This next year of “firsts” without our moms is going to be a rough one. I grant you strength as we carry on to comfort ourselves, our fathers in their loss and all of the members in our families. God Bless. You and your family have been in my thoughts…I lost my Dad just over 3 years ago–he had been living with a form of dementia for over 6 years and his quality of life had changed drastically. I felt privileged to be part of his journey and, with family and care workers, we tried to care for him as best we could. Like you, I try to remember him before his sickness took hold. Your mom will always, always be a part of you and hold a dear place in your heart. So sorry for the loss of your mom. Mom’s are the most important people in our lives in many ways. Take comfort in your memories and remember that most important lesson – that life is indeed short. As a breast cancer survivor, I learned how precious each day is. Live in the moment and love the people in your life! Hugs. Hi, So sorry to hear of your loss. I use your calendar printables everyday and I just wanted to say thank you. It is so good to hear from you and I am glad you and your Dad are coping as best you can. 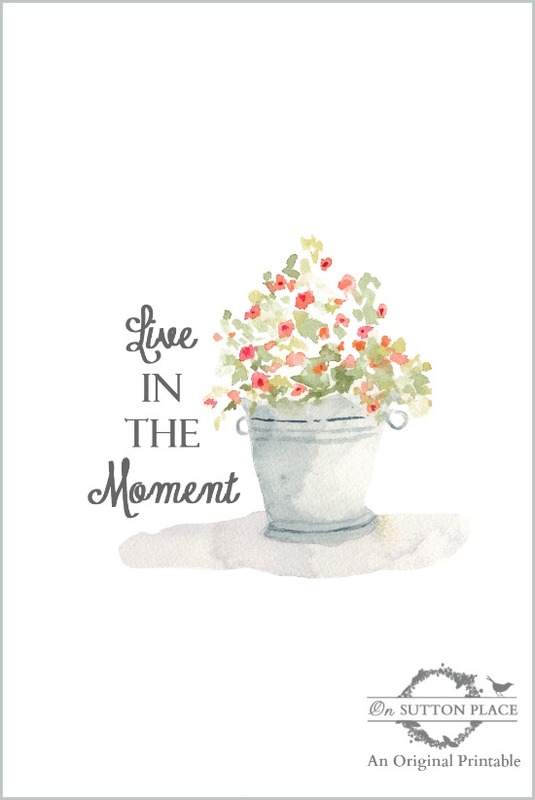 Thank you so much for the “Live in the Moment” printable. It is such a good reminder. My daughter has finished her 30 radiation treatments and didn’t miss a day of teaching! It was hard, but she was determined. We are so proud of her. We don’t know what the future holds, but we go forward each day with confidence. Take care. I’ve been anxiously watching and waiting for your return, and I’m so happy to see your email address pop up this morning. You’ve been in my thoughts & prayers, Ann. As for you, your Dad and everyone else who is caring has ever cared for a loved one in their final days, I’m sure God gives us all an “A” for effort. Wishing you an early spring, w/sunshine and forsythia. So glad to hear from you today. Your posts are inspiring . Have your sad moments, but in remembering the happy times your heart will lift with joyful memories. Prayers are with you and yours. Welcome back, Ann. Each of us finds a way to walk through our grief journey that is right for us. My father died in January. I have been working on a memory album combining photos and the stories he shared about his life. It has been therapeutic for me and will be a legacy for my children and their children. My mother has dementia so I’m glad I’ve written down most of her stories. She loves to look at family photos even if she doesn’t always remember who they are. It is hard to watch our parents age and even harder to lose them, but I am thankful for each day we had and will have together. Sorry this got longer than I planned. Holding you and your family in my thoughts and prayers. Ann, your post is an inspiration for me to be patient with my mother and to enjoy the moments that I have with her. She’s 93 so I will be facing this one day! Keep thinking and remembering those beautiful memories that you have of your mother! Glad to see your post Ann. Both of my parents have passed on and I still miss them everyday. But I have so many wonderful memories of them and that helps me. Sending hugs. I just logged on and there you were reminding all of us to stop and smell the roses. I think of you often. When my dad passed at 60 from diabetic complications, my mom was only 62. My Pastor gave me a wonderful book for her. I think it was called, Becoming a Widow. I know as my mom helped friends through the loss of their spouses she would give them this same book. It may be something for you to share with your dad. Loosing a parent is never easy, but I sure learned a lot from her that last year as she struggled with the changes going on. My mom passed at 87 and it will be nine years in April. I cherish every moment I had with her. Remember the God Whispers that one of your readers commented about. I responded to her with my most favorite God Whisper about my mom. Life hands us so many challenges, so many good things as well. Today is the anniversary of my Mother’s passing. At 96 she was ready to move on, it has been two years. May you find peace at this time and may your work (which is inspiring and lovely) help you during the transition. So glad to hear from you today. I is always good to know that we are not alone . It makes life hard times easier. So thankful the Lordd says I will never leave you nor forsake you. Love your drawing. Ann, my mother passed away 22years ago, and hardly a day goes by that I don’t wish I could just have a conversation with her to tell her about what is going on with our family. She lived with us the last 3years of her life. What a blessing for my 3children to have happy memories of her evan though she was not in the best of health. May God comfort you and your family in your loss. Ann…it is so wonderful to see you back. Your post brought tears to my eyes reminding me of losing my dad three years ago. Huge HUGS to you! Losing my parents was the toughest thing I ever had to do in life. I sorely miss my father but he lived a full life. My mother was taken suddenly 18 years ago now. If you are anything like me – and I think you are because we’re friends, rest assured that everything you are feeling and experiencing is normal. Honestly, I still have days when I miss her so much it brings on the tears after all this time, but then I remember how wonderful she was and how I was blessed to have her as a Mother and that makes me happy. I love your remark about “A” for effort. I think I’ll use that as my personal motto going forward. Live in the moment! Love to you. I, too, have been thinking of you at the very sad time. I saw how many people had left their condolences so I thought I would wait to leave mine. I lost my mum a couple of years ago and it does get easier with time, although you never stop missing them. With very best wishes from over the pond. Need more good people in this world today of all the crazy stuff that goes on.I miss my mom also sometimes I see an older lady in the store with gray hair pushing a cart and just want to go up to her and say Hi mom what are you doing? So time passes and things do become more important and people. Surround yourself with the good. I enjoy your blog and love to hear your story. Your amazing. I’ve been thinking about you lately Ann. I’m so happy to hear from you and I’m glad you have so many awesome friends here to keep your spirits lifted. Just know we are always here for you and we love each and every project you share. Keep it up, you’re doing fantastic! My thoughts and prayers have been with you during this difficult time. It’s a blessing to be left with beautiful, loving memories of your mother. Yes, live in the moment – and take care. It always amazes me to know that you are out in cyberspace Ann and to be able to tell you are a beautiful person.thank you so much for your caring words,they mean a lot to so many people.this is what makes the world a better place for us all. Welcome back, Ann! Your “live in the moment” printable (which I downloaded back when you first introduced it) sits prominently in a gilt frame on my coffee table. You shared it with us just when I needed it most, following a frightening medical diagnosis. I’m still here and it reminds me daily of what’s important. Thank you. This will be the third time in as many days that I have share this quote. While I hope it will be the last time for a long while, I think it is so profound and beautiful I want to share it again and hope it brings you some peace: Grief never ends but it changes. it’s a passage, not a place to stay. grief is not a sign of weakness, nor a lack of faith, it is the price of love. Finding something tangible like working on your wonderful blog during this time, is living in the moment. I’m glad you and your dad is remembering your mom before her illness, like how my mom and sisters remembered their husbands. You said that you haven’t made anything new the past few months, could it be your mom was front and center in your heart? May this Spring give you beautiful flowers and warm sunshine to put a balm on your heart. OH, Ann! I don’t know how I missed your post about your mom. I offer my most heartfelt condolences. Giving up our parents is such a hard part of life. Just know that I am thinking of you and praying for you. So glad you’re back. I know its a journey watching a parent fail physically and saying good bye. Losing my dad 4 years ago was one of the hardest things I’ve faced. But I remember how he loved God and our family. On days when you think your heart is breaking all over..cling to the thoughts of cherished memories, fun times and the promise of seeing them again. Ann – welcome back! Thank you for an update on yourself and your father. We are truly “virtual” friends. I really like how you said how you won’t let her “final years define her” – so appropriate and I needed to read that this morning as I deal with my mom aging. Dear Ann, I lost my son to cancer two and a half years ago…he was 29 and the light of my life…I am still trying to find my way through the grief so I understand some of what you and your Dad are going through. I found your blog… the photos of your beautiful creations have given me many moments of peace…just looking at them has a calming effect and I love learning how to recreate them. I know my family has gathered close to support each other and that is the special gift you also have. I wish you all well. I’m sorry about your mom. My condolences to you and your family. Your mom will be missed by her loving family. Glad to hear your dad is doing well. And inderectly your word are in inspiration. Thank you.